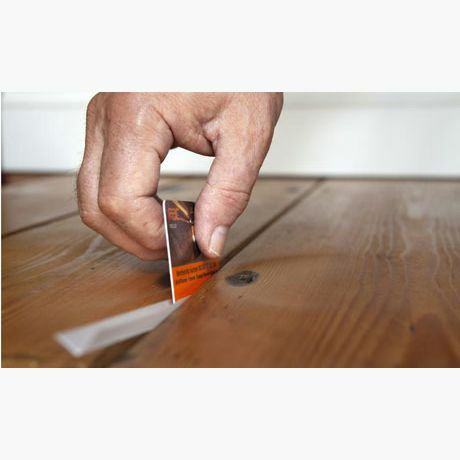 StopGap is a new type of draught seal that solves the problem of draughty floorboards. It can also stop dirt, dust, insects, smells, and noise. Made from flexible plastic, it is practically invisible after fitting. StopGap is made from flexible, springy plastic, the seal sits invisibly in the shadow at the bottom of the gap, leaving the appearance of your floor unaffected. Fitting StopGap couldn’t be easier. To calculate how much Floorboard Stopgap Draught Excluder you will need, please see the "Technicals Tab". We are confident that you will be happy with your stopgap, if you are not please return any unused stopgap in the original packaging and we will refund the price of the product, minus any P&P costs. Invented, manufactured and packaged in the UK. A 12 x 12ft room has approximately 25 floorboards and an average gap area of 3.87ft² which is similar to a small window being left open. Step 4: Divide by 40 to see how many 40m rolls of Floorboard Stopgap draught excluder you will need. My floor has just been finished and looks gorgeous. Can StopGap prevent the terrible draughts without spoiling the appearance too much? There are black lines on the underside of my carpet underlay and carpet. Do I need StopGap? There are black lines around the edges of my carpet and the hoover can’t reach them, what do I do? My boards have gaps on the Surface but if I try to push a knife into the gap, there seems to be a blockage a short distance down in the gap. Can I use StopGap? How many packs of StopGap will I need for my room? Will I have to take my furniture out of the room? Is any preparation needed before Fitting? Does fitting involve the use of adhesives, solvents or other noxious substances? How long after StopGap has been fitted should I wait before I replace my rugs? What kind of return can I expect from my investment in StopGap? Can I use StopGap for anything else? Can StopGap help with draughts through my sash windows? What should I do when it’s time to renew the finish on my floor? I have painted my floor, is StopGap available in colours? I have tongue & groove boards which are very draughty, can I use StopGap? 1. Do I need StopGap? If you have floorboards and wonder why it’s cold or draughty. The problem is GAPS! Wooden floors have lots of them. If you add up all those gaps you’ll find that the average room has a total gap area of 50 x 50cm – equal to a wide-open window. 2. My floor has just been finished and looks gorgeous. Can StopGap prevent the terrible draughts without spoiling the appearance too much? Yes, StopGap is hardly detectable when fitted. 3. There are black lines on the underside of my carpet underlay and carpet. Do I need StopGap? This is dirt left by the movement of air up through the gaps. StopGap will combat the problem. 4. There are black lines around the edges of my carpet and the hoover can’t reach them, what do I do? These are caused by the carpet acting as an efficient filter and collecting the dust from the air as it passes through the gap between the skirting board and floor. The answer is to seal off these gaps with neutral StopGap. The gaps in my floor are irregular and some are very wide. Help! Don’t worry. StopGap has been engineered to work in gaps from 1 to 8mm. 5. My boards have gaps on the Surface but if I try to push a knife into the gap, there seems to be a blockage a short distance down in the gap. Can I use StopGap? 6. How many packs of StopGap will I need for my room? An average (16sq metres) room will need two 40-metre rolls. 7. Is it easy to fit? Fitting is very straightforward – like posting a letter. 8. Will I have to take my furniture out of the room? No. Some items may need to be moved to one side temporarily. 9. Will I need tools? No! just a pair of scissors and old credit card. 10. Is any preparation needed before Fitting? It can make fitting easier if dirt and dust in the gaps are loosened. Use a thin plastic tool such as a knife or old credit card and then vacuum. 11. Does fitting involve the use of adhesives, solvents or other noxious substances? Definitely not, StopGap is specifically designed to be fitted dry. 12. Can anyone fit StopGap? 13. How long after StopGap has been fitted should I wait before I replace my rugs? No need to wait. Your room can be back to normal in 60 minutes from start to finish – with absolutely no cleaning up. 14. What kind of return can I expect from my investment in StopGap? For most people, the most important result is that, at last, their room is comfortable. However, tackling draught could make substantial savings on heating costs. Depending on local factors, StopGap could pay for itself in as little as 12 months. Thereafter, you will save money year after year after year. 15. Can I use StopGap for anything else? StopGap sounds great for floors but has anyone ever used it for other things? Yes. StopGap can be used almost anywhere there is a need to fill a gap temporarily or permanently. For example, to stop or reduce: draughts, dust, pollen, spiders, flies, light, heat, and noise. 16. Can StopGap help with draughts through my sash windows? Yes. Because StopGap does not use glue, in the spring it can simply be removed from the windows you frequently open, and re-used in the autumn. For this application, choose StopGap ‘neutral’, which is translucent. 17. Can it be removed? StopGap can be removed in minutes should you suffer an attack of nostalgia and long for those penetrating draughts. 18. What should I do when it’s time to renew the finish on my floor? It’s possible to remove and replace the StopGap to avoid the possibility of damage by solvents. This should not be necessary with water-based floor coatings. During this process, some damage to the strip may occur depending on the condition of your boards and the presence of sharp edges or nails. Lengths of damaged strip will need to be replaced with new. 19. I have painted my floor, is StopGap available in colours? StopGap is hardly visible in use so no matching is really necessary but for light coloured floors you may prefer StopGap ‘neutral’, which is translucent. 20. I have tongue & groove boards which are very draughty, can I use StopGap?